Father, you called St. Anselm to study and teach the sublime truths you have revealed. Let your gift of faith come to the aid of our understanding and open our hearts to your truth. Grant this through our Lord Jesus Christ, your Son who lives and reigns with you and the Holy Spirit, one God, for ever and ever. Amen. Anselm Agonistes: the Dilemma of a Benedictine Made Bishop | Paschal Baumstein O.S.B. 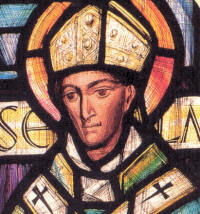 St. Anselm (1033-1109) was born in Aosta, Italy, and died in Canterbuy, England. St. Anselm's services to the Church are principally the following: First, as Archbishop of Canterbury he defended the rights and liberties of the Church against the encroachments of the English kings, who plundered the Church's lands, impeded the Archbishop's communications with the Holy See, and claimed the right to invest prelates with ring and crosier, symbols of the Church's spiritual jurisdiction. Second, as a philosopher and theologian he developed a method of reasoning which prepared the way for the great thinkers of the Middle Ages. Third, he had a great devotion to Our Lady and was the first to establish the feast of the Immaculate Conception in the West. Symbols: Benedictine monk admonishing an evildoer; archbishop; ship; with Our Lady appearing before him; with a ship. Learn more about St. Anselm and his works at the Internet Encyclopedia of Philosophy. Those who are truly ambitious might tackle this 2 volume set by Martin Rule published in 1883: The life and times of St. Anselm, archbishop of Canterbury and primate of the Britains, Vol. 1 and Vol 2.